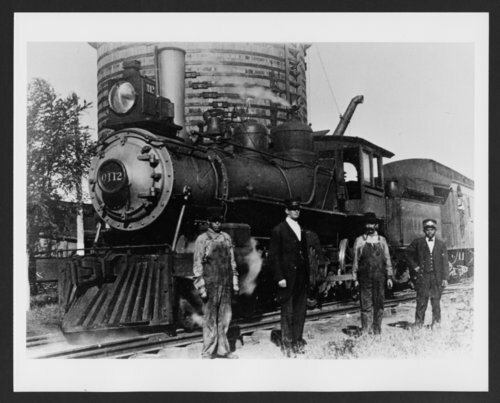 This photograph shows a train crew standing in front of the Atchison, Topeka and Santa Fe Railway Company's steam locomotive #0112 in Crescent, Oklahoma. The locomotive, built in 1891 in the Topeka shops, was originally No. 28 and later renumbered #55 and #0112 respectively. On February 22, 1915, the locomotive was scrapped in Topeka, Kansas.